"Nightflyers," a novella by George R.R. Martin, has been picked up for a 10-episode first season by Syfy channel. 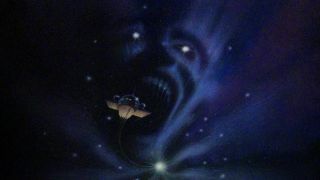 Syfy channel has announced an official series order for the series "Nightflyers," based on a sci-fi-horror novella by George R.R. Martin, including new production and casting information for the 10-episode first season. Martin is known for the series "A Song of Ice and Fire," which became the HBO series "Game of Thrones." He has teased that the "Nightflyers" filming location in Ireland could allow access to actors who have become well-known — or even been killed off — on the HBO fantasy. In a statement, Syfy revealed that Jeff Buhler ("Jacob's Ladder"), who wrote the TV adaptation, would executive produce with Daniel Cerone ("The Blacklist"), who will also be showrunner. Martin himself will be an executive producer as well. Netflix will co-produce and get the first shot at distributing the show outside the U.S.
Gretchen Mol ("Boardwalk Empire") will star as Dr. Agatha Matheson, with Eoin Macken ("The Night Shift") as Karl D'Branin, David Ajala ("Fast & Furious 6") as Roy Eris and Sam Strike ("EastEnders") as Thale. The rest of the cast includes Maya Eshet ("Teen Wolf") as Lommie, Angus Sampson ("Fargo") as Rowan, Jodie Turner-Smith ("The Last Ship") as Melantha Jhirl and Brían F. O'Byrne ("Million Dollar Baby") as Auggie. "'Nightflyers' follows eight maverick scientists and a powerful telepath who embark on an expedition to the edge of our solar system aboard The Nightflyer — a ship with a small tightknit crew and a reclusive captain — in the hope of making contact with alien life," Syfy representatives said in the statement. "But when terrifying and violent events begin to take place they start to question each other — and surviving the journey proves harder than anyone thought."